San Diego, Tampa Bay, and Washington staged a battle royale on Wednesday, engaging in a three-team trade involving a whopping 11 players. Though the Padres’ acquisition of 2013 AL Rookie of the Year Wil Myers from the Rays is the centerpiece of the deal, the Nationals might be the team that leapt into the ring, whacked the opposition with a steel chair, and snuck away with the championship belt. Rumors began circulating at last week’s winter meetings that several teams were pursuing Myers, and the Padres managed to reel him in while also acquiring catcher Ryan Hanigan, minor league left-hander Jose Castillo, and minor league right-hander Gerardo Reyes from the Rays. In return, San Diego sent veteran catcher Rene Rivera and four prospects (right-handers Joe Ross and Burch Smith, shortstop Trea Turner, and first baseman Jake Bauers) to Tampa Bay. The Rays then flipped Ross and Turner to Washington for outfielder Steven Souza and minor league lefty Travis Ott. That’s … a lot to process, so let’s take this team by team to figure out what it all means. For much of the 2014 season, the Friars’ offense was unwatchably, historically bad. Though the club avoided all-time futility after it started to score some runs late in the year, it was clear the organization had to bring in some bats if it wanted to win games and keep fans from playing Exciting Hour2 on their phones for three hours rather than watch 15 batters strike out every night. By adding Myers as Kemp’s wingman for at least the next five seasons (both players are under club control through 2019), the Padres have addressed their chief concern. When the Royals sent Myers to Tampa Bay two offseasons ago, I praised the deal for the Rays, noting that young, talented, cheap, healthy, and MLB-ready top-five prospects almost never get dealt. Myers backed up that praise by breaking into the big leagues and hitting .293/.354/.478 in 2013, 31 percent better than league average on a park-adjusted basis, and enough to earn him rookie of the year honors. That’s the hitter the Padres hope they’re getting, though Myers’s 2014 campaign brought a steep regression in which he hit a brutal .222/.294/.320. While some might be tempted to blame that on a midseason wrist injury that limited him to just 87 games played, he’d batted a mere .227/.313/.354 in 224 plate appearances before getting hurt.3 As if those numbers weren’t enough of a red flag, Myers exacerbated the problem by saying he’d slacked off over the winter. In a way, that could be good news for the Padres. While work ethic seems to have played a part in the Rays’ willingness to move Myers, attitude is something the young outfielder can choose to improve, which could mean a return to offensive form in San Diego. Of course, this isn’t the first time the Rays have dealt a promising young stud because of makeup concerns. It’s hard not to see similarities between this deal and the six-player Delmon Young swap Tampa Bay and Minnesota agreed to in November 2007: In both cases, the Rays shipped off a highly touted prospect once loved by management, putting more stock in his various shortcomings (in Young’s case, lousy defense and an iffy batting eye; in Myers’s, so-so defense, questions about work ethic, and lingering doubts over his 2014 numbers) than in his exceptional talent, big rookie-year numbers, or numerous years of cheap team control. Despite the Rays’ loss of faith, though, Myers at his best remains an incredibly gifted hitter — with the raw power to send fat pitches into orbit and the flair to break into The Show with an opposite-field grand slam (and emphatic bat flip). There’s a speck of Vladimir Guerrero in Myers’s free-swinging approach, big-time pop, and bare-handed swing. At least, that’s what the Padres hope. They’re banking on a hitter who’s struck out in nearly one-quarter of his plate appearances in the high minors and majors refining his approach enough to be a consistent threat. They’re counting on last year’s injuries proving to be a blip on the radar. They’re relying on Myers learning from past mistakes and, still just 24 years old, growing into the perennial All-Star he projected to be. San Diego managed to land Myers without touching its electric rotation of Andrew Cashner, Tyson Ross, Ian Kennedy, Jesse Hahn, and Odrisamer Despaigne, leaving open the possibility of moving one (or two) of those arms for a left-side infielder and/or a true center fielder. The Padres could also look to move someone from their outfield surplus, most likely Carlos Quentin, who has one year and $8 million left on his contract. Quentin has struggled to stay healthy, but he posted a combined 145 wRC+ in 2012 and ’13 and could be a great fit for the outfield-needy Orioles. Castillo and Reyes don’t look like impact prospects, and a Hanigan-Rivera swap looks fairly even for the two clubs, assuming Hanigan shakes off his own 2014 injuries to become a capable replacement for new Dodger Yasmani Grandal. So this comes down to Myers, the potential star who’s already on his third team, making a difference for a club that desperately needs a jolt of offense (and excitement) after losing for too long. Unlike the Padres, and despite a down 2014, the Rays have gotten used to winning. The thing about being a tiny-revenue David in a division with multiple Goliaths, though, is that you have to be close to perfect to succeed. And despite winning two AL East titles and making the playoffs four out of six times from 2008 through 2013, the Rays have been far from that in recent drafts. I dare you to look at what the Rays have done since the ’08 draft and not scream in terror: When a total of 19 first-round and sandwich-round picks have combined to produce seven at-bats in the majors, we can safely call that less than perfect. That’s why the Rays felt a need to replenish what has become a shaky minor league system. They’ve traded Cesar Ramos, Jeremy Hellickson, Sean Rodriguez, and Matt Joyce in the past six weeks, trimming payroll while upgrading their organizational depth (and, in the Joyce deal, landing a quality big league reliever in Kevin Jepsen). The Myers trade is a supercharged version of that strategy: Teams are going to give up a hell of a lot more for a 24-year-old former phenom than for a bunch of useful non-stars testing arbitration. The Rays will say they have every intention of competing for a playoff spot in 2015 and that none of these deals eliminates that possibility, but their main goal is clearly to build a talent base that could potentially go on another run like the one the club managed from 2008 to 2013. One manager on Jake Bauers: "He hits everything: RHP, LHP, FB, SL, CHG. Can hit velocity. Baseball rat who controls the K-zone." That leaves Souza, who, along with Myers, will decide how this trade grades out for the Rays. To get Souza and Ott from Washington, Tampa Bay had to give up Ross and Turner, considered by many to be the top two prospects in the entire three-way affair. Ott is a long shot, and I’ll cover Ross and Turner in more depth in the Nats’ section, so let’s talk about Souza. First, the good news: There’s a chance the guy rakes. The 6-foot-4, 225-pounder followed an unimpressive start to his minor league career with a breakout power season in 2012, batting .297/.366/.572 with 23 homers and 22 doubles in 353 at-bats at Single-A. He delivered comparable production in 2013 at Double-A, then capped his minor league apprenticeship by hitting a robust .345/.427/.577 with 18 homers and 25 doubles in 357 at-bats in 2014, thus earning a call to The Show. The Rays traded a young, cheap, right-handed power hitter in Myers, but Souza might be a capable young, cheap, right-handed power hitter himself. He’s also got decent speed for someone his size, with 158 steals on his minor league ledger. Now the bad news: First, Souza isn’t that young. He’s a year and a half older than Myers, yet he’s stepped to the plate just 26 times in the majors. Plus, though he’s posted some solid numbers, he lacks the tool set that gets scouts drooling. There’s a reason everyone knew who Myers was before he ever played a major league game, but only diehards and Nats fans could pick Souza out of a lineup. The Rays will hope that performance trumps scouting reports here, and that Souza becomes their own junior version of Paul Goldschmidt, another relatively late bloomer who never ranked high on prospect lists, yet became a star in the bigs. Of course, they’d settle for him being a reasonable facsimile of Myers: a good player who, despite rarely wowing with his core skills, hits enough when healthy and humming to be a valuable bat in the middle of the lineup. Given that Souza offers one more year of control than Myers, that the Rays chopped payroll in this deal, and that they also got three other young guys to dream on, that version of Souza would do just fine. That version remains a big if, though. Prospect depth is nice to have, and trimming costs is a constant goal for a team with perennially weak revenue streams, but the Rays are also exactly the kind of team that most desperately needs young, cheap, impact players doing damage before they leave for greener pastures. If Myers becomes the player most of us thought he’d be just a year ago, this might not end well for Tampa Bay. 1. Ross and Turner could become very good major league players. In a recent writeup, Baseball Prospectus raved about Ross’s fastball and the upside of his slider, proclaiming him a future no. 3 starter in the majors “if it all clicks”; in an age when talented but injury-prone mid-rotation starters are pulling in big bucks, that’s a valuable commodity to have. Meanwhile Turner — who’s officially listed as a player to be named later in the trade because he was just taken as the no. 13 overall pick in June’s amateur draft — is blazingly fast and already plays big-league-caliber defense at shortstop, with impressive range and footwork and a playable arm. You can check out lots of stats and graphs on him here, but the bottom line is this: Even if that’s all Turner becomes, he might still be able to play a few years of shortstop in the majors given how thin the position always is. If he starts to hit, though … look out. 2. Souza was expendable. 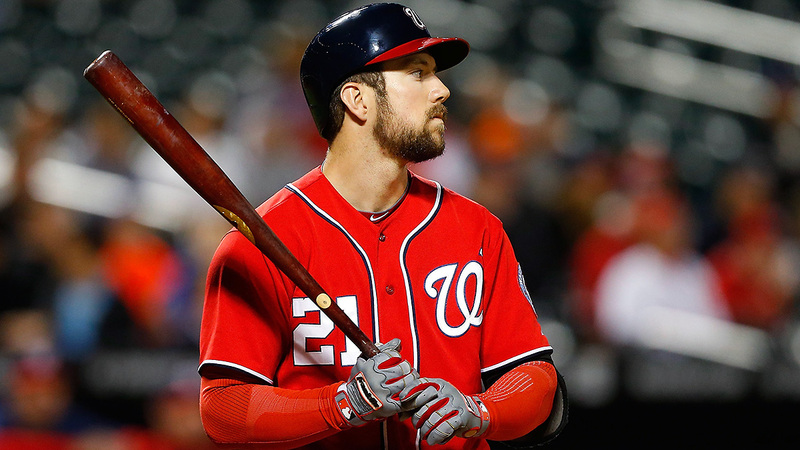 He was slated to be the fourth outfielder on next year’s team, with Bryce Harper, Denard Span, and Jayson Werth all entrenched as starters. If he becomes an impact hitter with the Rays, Nats GM Mike Rizzo might later feel a small twinge of regret. But when a player offers mostly theoretical value for a club, it’s often best to give another team a chance to unlock that value — especially if doing so means landing two prospects who play positions that are more pressing to fill. 3. Speaking of pressing holes: The Nats might have just solved major question marks at two positions without giving up any of their biggest trade chips. Starters Jordan Zimmermann and Doug Fister have been at the center of trade rumors this offseason, and while either would be a major loss, one will inevitably have to go since they’re both a year away from free agency. Star shortstop Ian Desmond can also test the market 11 months from now, and the Nats didn’t have an obvious replacement for him lurking in their system. Now they have Turner as a potential Desmond replacement and Ross as someone who could eventually step in for Zimmermann, Fister, or Stephen Strasburg (who’s two years away from free agency, but as a Scott Boras client will be a bear to re-sign). For now, the Nats boast the same formidable rotation they owned while rolling to an NL East title in 2014. They retain the opportunity to trade Zimmermann or Fister for the right offer while knowing they don’t need to pull the trigger if the return they want isn’t there. They bring back a deep and potent lineup that finished third in the NL in runs scored last season, and could improve if Ryan Zimmerman can stay healthy at first base in 2015. Long-term, it might be tough to retain their three big right-handed starters and Desmond and Bryce Harper, who’s four years away from free agency, but will eventually cost an obscene amount of money to lock up. But somehow, some way, they just upgraded their future prospects while avoiding weakening their chances at a 2015 World Series run. That’s a pretty great outcome for the last man into the ring. Or phase one, if the Padres and Dodgers fail to finalize the Kemp deal by Thursday amid murmurs of issues with Kemp’s physical. Come at me, modern-day video game bros. Meanwhile, former Rays James Shields and Wade Davis went hog wild last season, helping propel K.C. to the World Series and making pundits like me who’d knocked the Royals for dealing Myers look really, really wrong.